I may be the last of a dying breed — one of the few remaining people on Earth who still sometimes writes letters to people by hand. There is a ritual involved for me, a chance to unwind and connect with someone I care about and to do so in an old-fashioned way. I turn off all things electronic. I sit at my desk in my home library, look out the windows and watch birds and squirrels flutter and dart around my vegetable garden. Time slows down. I reach into an antique inkwell, one of many that I own, and pull out just the writing instrument the particular letter calls for. It’s usually an actual quill pen. Yes, I write with a feather. Sometimes I use a fountain pen. I think very carefully about what I want to say as there is no margin for error when writing with such a tool. I loathe scratching out words and my letters tend to be quite long. I finish my missive, slide it into an envelope, drip hot wax onto the back and press a seal into it. I lick old but still perfectly valid stamps and mount them on the front. The completed work delivers immediate satisfaction to me and, I know from experience, the reader on the other end. Running an antiques and collectibles business gives me frequent opportunities to obtain treasures like an antique inkwell and fine writing instruments. I try my best to let them go as a dealer who holds onto his daily finds is a dealer who will soon be out of business. 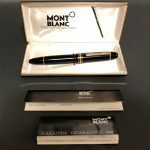 Montblanc fountain pens for sale in Orion’s Attic eBay store. I’m thus happy to report that we have just placed for sale in our Orion’s Attic eBay store a rare and gorgeous Art Nouveau-style antique inkwell made by German artist Wilhelm Zwick around 1930. 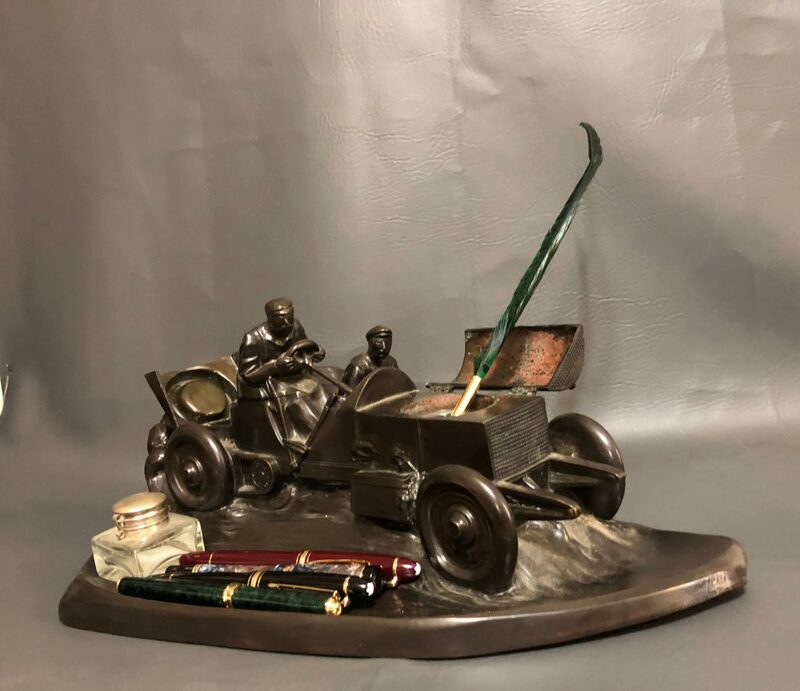 The signed bronze-painted pewter inkwell features a 1908 Grand Prix Mercedes driver and mechanic racing a car along a dirt road with a cloud of dirt flying up from behind them. The hood/bonnet opens to reveal a compartment for a glass inkwell. (We do not have the glass inkwell.) The trunk opens to reveal a compartment for stamps. The road serves as a space/tray for pens. The piece measures about 15.75 inches long by 9 inches wide and stands about 6 inches tall. The underside contains a foundry mark of a German eagle and the word “Kayser”, representing maker Kayserzinn, above the number 28. Artist Wilhelm Zwick (1839-1916) created this motor racing model to capture the interest in the sport at that time. The Kayserzinn factory was founded in 1862 and commissioned a number of famous German artists. This piece would make for a tremendous addition to the collection of anyone who shares my passion for antique inkwells and old pens. Serendipity also just brought us more than 50 vintage pens that we are now in the process of adding to our eBay store. See the Fountain Pens & Ink Wells department now and in the days ahead. The collection includes more than a dozen Montblanc, S.T. 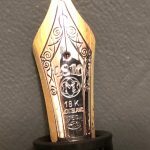 Dupont and Parker fountain pens with gold nibs along with more than 40 other fine pens. If you’re in the market to add to your collection, I hope you’ll find something that you’ll love. If you’ve never thought writing letters to loved ones by hand, now is a great time to start. I guarantee you that the recipients will appreciate the time you take to write them. And if you happen to own a collection of antique inkwells and vintage fountain pens that you would like to sell, well, contact me today and I’ll be more than happy to help with that, too. Just promise that you will encourage me to put them up for sale right away! Orion’s Attic provides “one call solves it all” estate liquidation services in the greater Maryland, Washington D.C. and Virginia region and sometimes beyond. When there’s great stuff, we go! We sell your treasures, take care of your charitable donations and junk removal. We’re also always looking to buy a wide variety of antiques and collectibles including fine and costume jewelry, vintage toys, sports memorabilia, military items, rare books and so much more. Advertising, antiques abound at massive Silver Spring estate sale April 28-29! Mind boggling array of collectibles, jewelry, tools and so much more!